PLEASE NOTE: The antique diamond and gold ring shown in the photos is sold. It was made using Stone #7, as shown in the final photo. 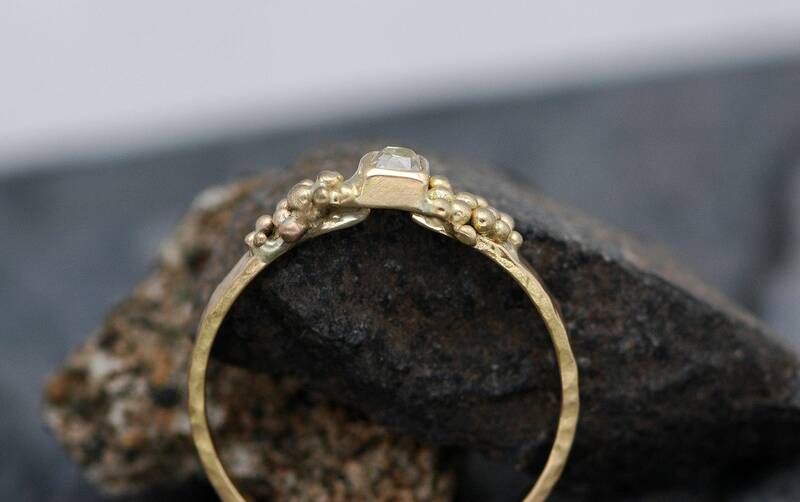 This listing is for a custom, made to order ring in a similar style. 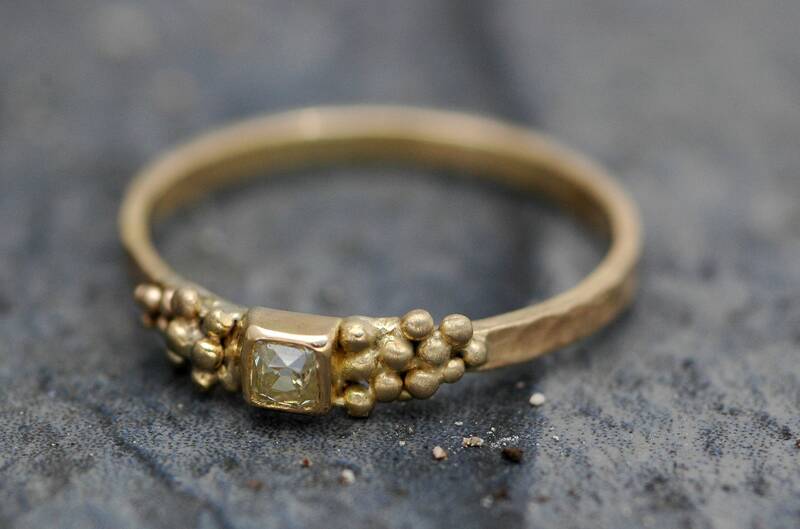 As this ring is completely custom-made by me in my studio, it can be built with a different width of band. It can also be made with a half-round/domed profile band, with any finish. As well, it is available with a bezel setting for the diamond. I can make it in 18k gold of any colour, palladium, or platinum. 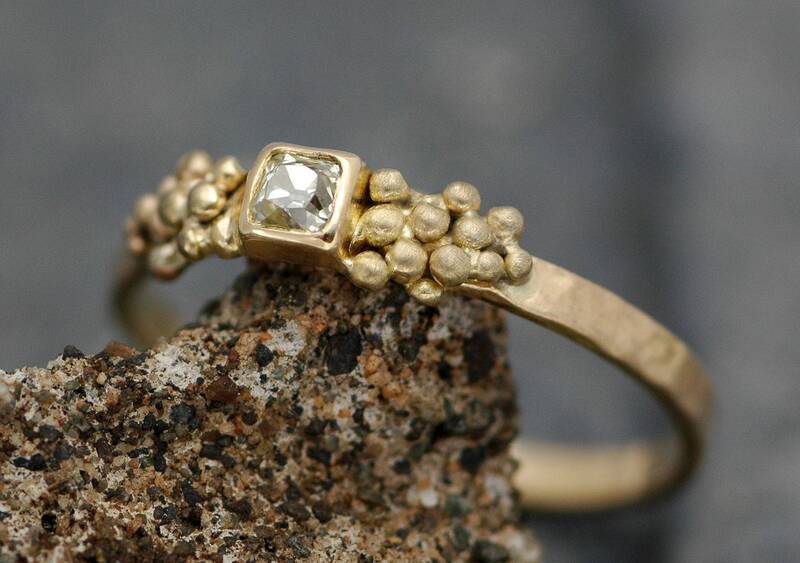 This unique engagement ring is built around a one-of-a-kind, antique diamond. This diamond was cut some time between 1830 and 1880. It is what is known as an Old Mine Cut, or Old Miner Cut diamond. My Old Mine Cut diamonds were purchased from one of my select American cut diamond dealers, and are verified by them as being of the Old Mine era, and as not having been recut at any time since their original cutting. Please be sure to check the provenance of any antique diamond you are purchasing- as antique diamonds become more sought-after, some diamond cutting companies are now replicating this Old Mine Cut, but using modern cutting techniques. Old Mine Cut diamonds are the precursor to the modern brilliant cut diamond. 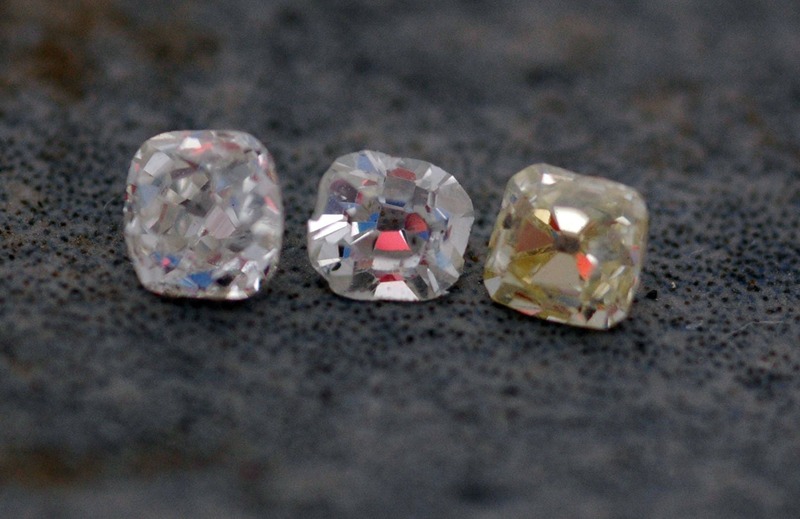 Unlike today's diamonds, which are mostly cut in a machine/computer-assisted way, each of these antique diamonds was cut by hand. They differ from modern diamonds in that they have a relatively small table and very high crown. They were not round, but were given a softly angular shape. They are quite chunky-looking, and can be irregular in form, compared to modern cut diamonds. Each facet of an Old Mine Cut diamond was cut entirely by hand, meaning that their form has a very unique, organic, and handcrafted appearance. These stones were cut in order to throw back even the softest candlelight of the era from which they come. Any engagement ring built around one of these gorgeous stones is an absolutely unique piece, as no two Old Mine Cut Diamonds are alike. In my opinion, this cutting is the very loveliest cut, and is most honest to the diamond's original formation. 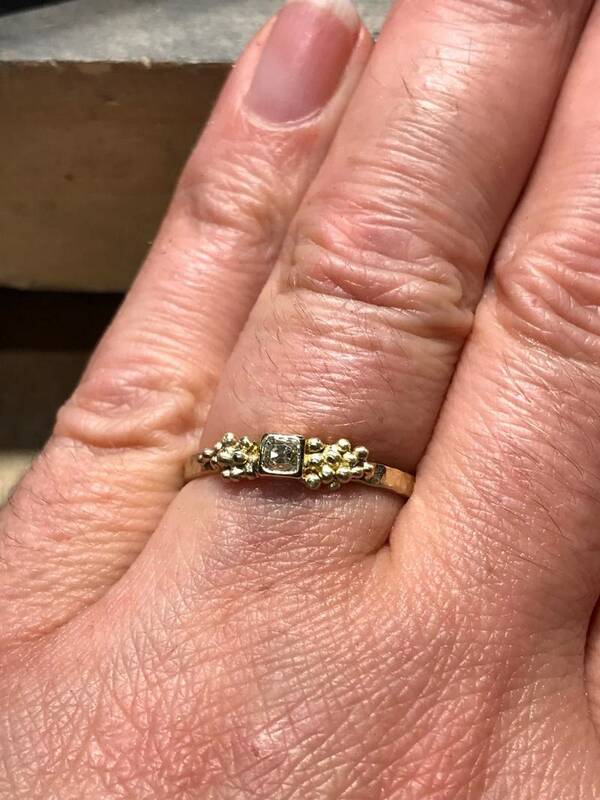 I feel an Old Mine Cut diamond would please a buyer who dislikes cut diamonds because of their somewhat mechanical and uniform look (a complaint I often hear about cut diamonds from my clientele). The Old Mine Cut diamond shown in the sold ring has a weight of .15 carats, and is 3.49 mm across. I am unable to capture the fire of this diamond with my camera- it is surprisingly brilliant and shimmery in real life. I have set the diamond in a handbuilt 18k bezel, with a 14k gold interior layer. The bezel has a high shine lip. The band is solid 18k yellow gold, and is 2mm wide by 1mm thick. It has a hammered texture, with a brushed overlay. The bezel on this ring has been formed so that you can wear it stacked flush up against a wedding band. 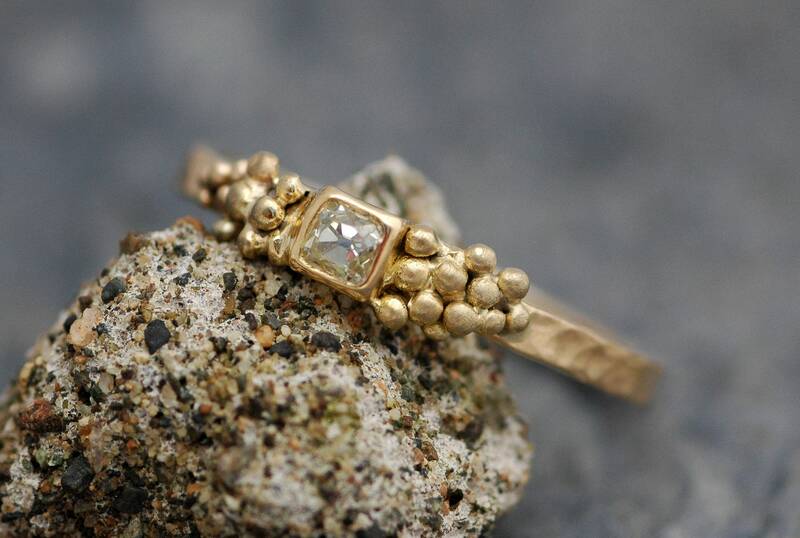 The bezel is flanked by a series of solid 18k gold granulation. I have a parcel of these gorgeous diamonds- they are shown in the final photos. 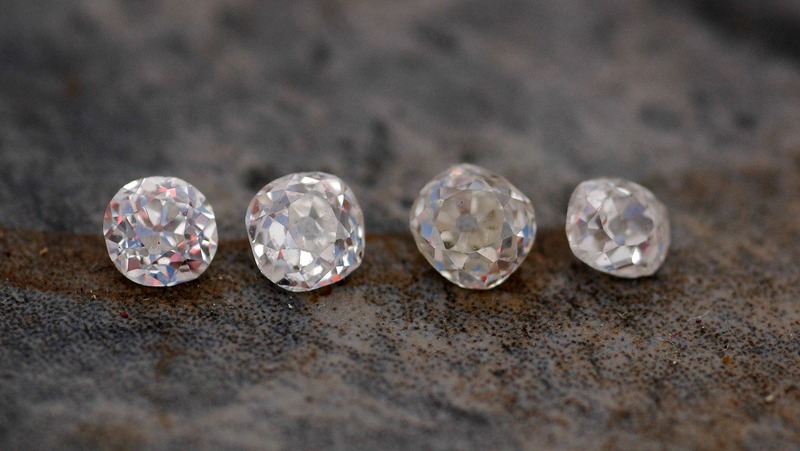 These diamonds are all transparent, with good clarity. They appear less fiery in the photos due to lighting conditions. 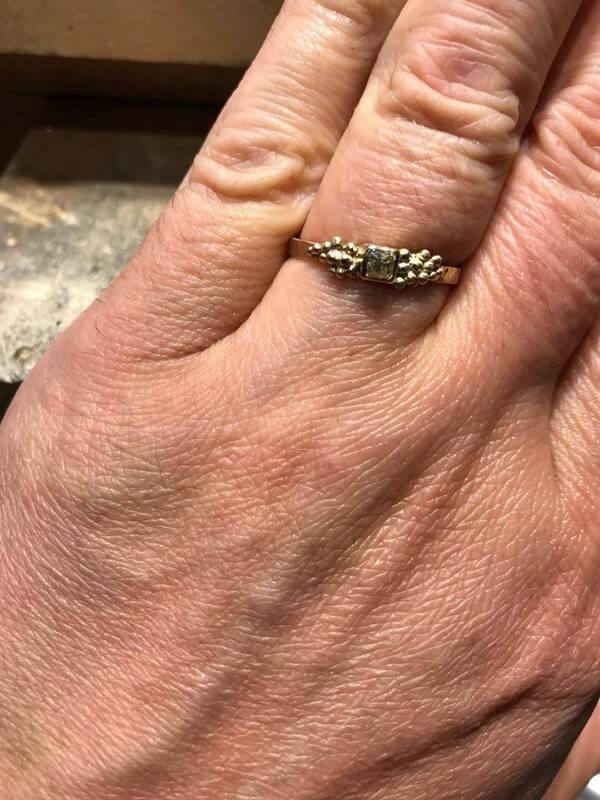 If you would like a quote on another stone built into the ring of your dreams, please contact me through the shop or at treloar [!at] telus.net Old Mine Cut diamonds can be found in larger sizes than those shown here. When choosing your diamond, please be sure to reference a metric ruler, to get a proper sense of scale. I have included two photos of the ring on my hand, which is really large- my ring finger is a size 9 (an average man finger size), to give you an idea of scale. Please reference a ruler. As I hand-fabricate each ring in my studio, I am able to build these with a wider or narrower band, in another colour (white or rose) of gold or in platinum, and with any texture you prefer on the band and the bezel. The rings can also be built with thicker bands, or bands with a half-round/domed profile. 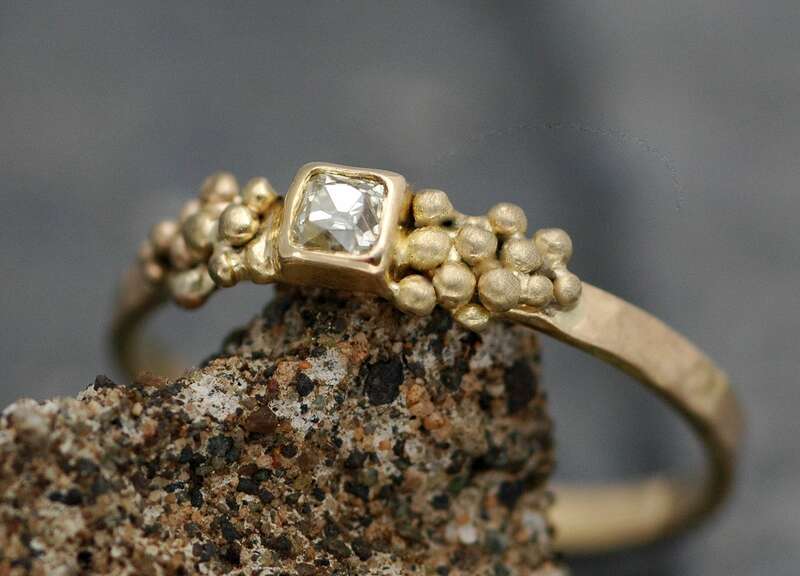 I can also set one or more of these diamonds onto one of my gold twig rings (14k or 18k rose, white, or yellow gold). If you would like a larger diamond (the larger diamonds in the photos are all within the same size range as the one in the ring), please contact me. I also have three smaller Old Mine Cut diamonds available, one in a fancy yellow colour (final photo). Contact me at treloar [!at] telus.net for other questions- I am happy to help.